Here at Daytona Sportswear we want to make the process as simple and stress free as possible for you. 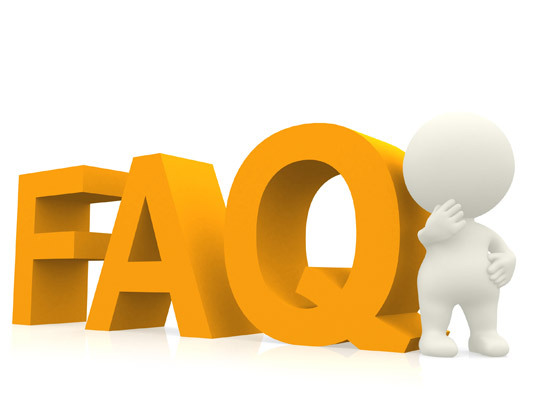 So to make ordering and understanding the process easier for you, we have compiled a list of Frequently Asked Questions. Of course, if you have further questions, please don’t hesitate to call or email us! If you find you have specific questions regarding art or the Art Department we also have some very useful information on our Art Department page as well. 1. When can I come in? 2. What can I order from you? 4. When will my job be done? 5. Do you have rush services? 1. What is the cost of embroidery? 2. How many stitches are in my logo? 3. What is the "One Time Set-up Fee" for Embroidary? 1. What is the cost of screen printing? 2. What is the "One Time Set-up Fee" for Screen Printing? 2. Why does it take 8-15 days for shipping? Q: When can I come in? A: We are open for business Monday through Friday, 8 a.m. - 5 p.m., and evenings and weekends by appointment only. Q: What can I order from you? A: T-shirts, tank tops, polo/golf shirts, button-up twill shirts, sweaters, sweatshirts, caps, hats, visors, beanies, aprons, coolies, towels, handbags, duffle bags, luggage, backpacks, and much, much more! Name brand manufacturers include Gildan, Fruit of the Loom, Jerzees, Hanes, Dickies, Bella, Outer Banks, Flexfit, American Apparel, Alternative Apparel, Ultra Club, and much more. We provide free catalogs in the office with an extensive selection of goods. A: For screen printing, we offer a low minimum order of 12 shirts with a 1 color screen printed design. For designs involving 2-4 colors, a 36 piece minimum order is required. Full color screen printed designs require a minimum of 72 pieces. The garments styles and colors you order may vary, however it is important to note that art may require ink color changes to work on different garment colors. Koozies with a 1 color print require a minimum order of 50 pieces. For multi-colored koozies, please call for a quote. Call for a quote on other promotional products as well, as minimum quantities may vary. For embroidery, there is no minimum order, any quantity is acceptable. Q: When will my job be done? A: Turnaround time varies with the nature of the job involved, and depending on the time of the year (mostly due to events). We steadily maintain a 10 business day turnaround from the time the order is placed, and the deposit is paid, (and if there is new art, it is approved). Commonly, orders are completed in advance, especially on re-orders. Q: Do you have rush services? A: A deposit is required when the request for a new design is placed, for screen printing or embroidery. A $50 deposit for embroidery, and a $100 deposit for screen printing must be paid on all new designs. The remainder is due at pick-up. We accept cash, checks and credit cards- Mastercard & Visa. Q: What is the cost of embroidery? A: The cost of embroidery varies based on the product ordered (polo shirt, cap, etc. ), the brand of product, the number of pieces in the order, the number of stitches in the logo, and the size of the embroidered logo. Generally the logo will run about $1 per 1000 stitches. Q: How many stitches are in my logo? A: Send us your logo in an email and we will find out for you! Then we will get back to you with an accurate quote. Q: What is the "One Time Set-up Fee" for Embroidery? A: For your Embroidery Design, on the first order there will be a set-up charge of $50 which covers digitizing the art. Once we digitize your art, we keep the embroidery on file for any re-orders. Q: What is the cost of screen printing? A: T-shirts: Our average price for each screen printed shirt, sizes small through x-large, with a 1 color left chest and 1 color full back design, is $7.50 per shirt. Pocketed T-shirts start at $8.50 (S - XL) with a 1 color print. For shirts sizes XXL and up, add $2.00. 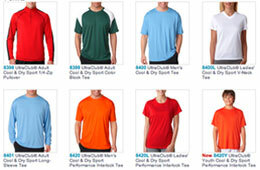 Prices per shirt increase with more colors added. We offer volume pricing on quantities over 144, so please contact us for a free quote! Contract Printing is available for orders with 36 or more pieces (Ask our sales staff for a contract printing chart). Q: What is the "One Time Set-up Fee" for Screen Printing? A: One Time Only Set-up: For each shirt design, there will be a one-time screen charge of $25 per color, and $45 per hour for art (which includes design, separations, and film). Art charges have a minimum of 1 hour. A: We ship anywhere in the USA and many countries internationally. Shipping takes 8-15 days and an additional 7-10 days to ship internationally. Q: Why does it take 8-15 days for shipping? A: We offer so many shirts and other products, in so many styles, colors, and sizes, we cannot keep stock on all the items we provide. Our press is constantly rolling, but the process of getting your order, screen printing the shirts, packaging, then shipping to your door takes 8-15 days. Please ask our sales department for cost of shipping. NOTE: DAYTONA SPORTSWEAR, INC owns all screens and films. Daytona Sportswear, Inc. is not an advertising agency or design company, so your art is your responsibility. If you need copies of your art, be sure you get an art cd with your art for back-up. Art older than two years of age will be discarded. ANY QUESTIONS? Please call us! We want to make this process as easy as possible for you so you can get the product you want in the quickest time frame possible.